Honduras is the second poorest country in the Western Hemisphere. Family income averages about $500 a year in the countryside where a majority of Hondurans live. The country is wracked by drug wars, corruption, very high unemployment, and a general lawlessness that pervades all aspects of society. It has the highest per capita murder rate of any country in the world. Other than multinational food companies and a growing garment industry, Honduras produces little for export. Exacerbating the dire situation are increasingly inconsistent rainy seasons that put subsistence farm families at tremendous risk. TCI’s work is concentrated in the village of El Rosario, located in the bucolic Locomapa Valley high in the northern mountains. The people in this area have a long record of working well with medical groups, and organizations such as Sustainable Harvest. Before TCI invested in El Rosario we were sure we would have a responsive, responsible, and appreciative community as a partner. This has proven the case. And while the people are poor, they are hard working, ambitious for their children, and open to suggestion. We have built a 7th-12th grade school in El Rosario that serves 120 students. Each student receives a full scholarship at a cost of $40 a year. 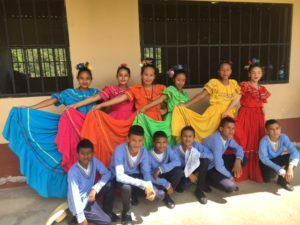 The curriculum is state-sanctioned, with graduating students receiving a Honduran high school degree. TCI assumes all costs of running the school except for teacher salaries, which are paid by the government. Built a community center, which serves as a recreation hall for young people, as well as a meeting hall for civic matters. Built a large library stocked with books, dvds, English language materials, projectors, computers and printers. The library serves as a meeting place for the community, home for “culture” nights, and a special place for sing-alongs, group reading, and literacy training. Provided over 250 solar lights to homes without electricity throughout the valley. Established a direct giving program, through which we have given $100 directly to 224 households in and around El Rosario. The money has been spent at a local hardware store, and must be used to improve the quality of life of the recipient household, with children especially in mind. Typical uses include purchase of flush toilets, outdoor showers and wash basins, cement floors, corrugated roofs, clean stoves, ventilation, etc. All of the installation work has been volunteered with the understanding that widows, the elderly, and the infirm will have their homes improved by their neighbors. Finally, in a parallel initiative, TCI co-founder Charlie Miller has personally led an effort to plant 3,000 mahogany trees and 5,000 coffee plants in El Rosario. Proceeds from the eventual sales of trees and coffee will flow through TCI, supporting our vision for Honduras, which includes making our work self sustaining through agriculture. Coffee profits should be evident by 2022. The mahogany return will begin in 2026. Paying workers to maintain the fields has an obvious benefit to the community, but the enduring expectation of a community income has the added benefit of providing stability and optimism. Charlie’s work in planting has had a wonderful residual effect: in observing our progress, seven local families have become encouraged to plant cash crops (coffee or cacao). We have delivered over 6,000 mahogany and cedar seedlings to farm families who have never “built for the future.” This points to early success in encouraging farmers to think long term and “build equity” in the land.